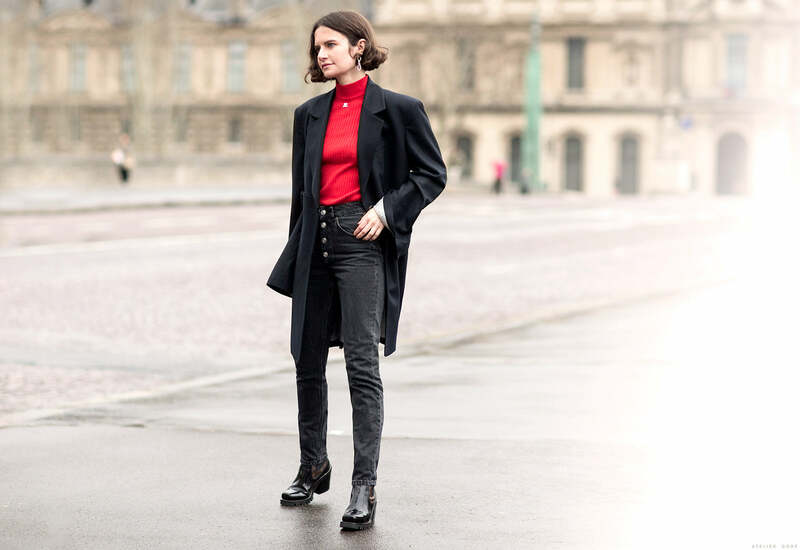 “I’m wearing a Moon Choi Studio Blazer, Courréges red turtleneck, Balenciaga jeans and Louis Vuitton boots. Mixing emerging designers (or vintage) with luxury pieces is the way I dress, and a reflection of my style. I don’t like it when anything is too obvious so I don’t wear “it” bags or a season’s key pieces. You have to know exactly what looks good or not on you, no matter if its a trend. My goal is to leave the house feeling comfortable, confident and feminine at the same time. I usually don’t wear a tight top AND bottom, I find it’s more chic to wear a tight top with very large pants (belted at the waist). My style is a balance and a contrast of volume and shape. For more of Marta’s style, check out her blog, Life of Boheme. J’aime ta garde-robe. J’aime qu’ils combinent les tons et que le blaizer donne cette touche d’élégance. I’m enjoying this “street style” series as it provides inspiration for those of us on budget who can riff off the shapes and colors. Love this boyish style. Parisian.